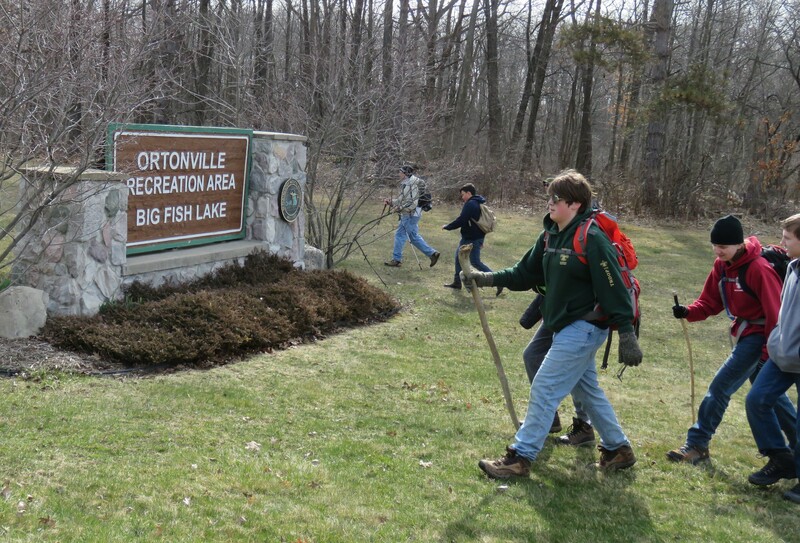 On Earth Day weekend almost 300 Boy Scouts gathered for two nights of camping near Big Fish Lake in the Ortonville State Recreation Area for the 10th annual Boonies Hike. None of the young participants or many of the leaders were alive for that first Earth Day, held on April 22nd, 1970. It was an era when Americans were slowly becoming aware of environmental concerns and the need to take action. It was a time when rivers were so thick with oils that some burned. Massive V8 engines swallowed enormous amounts of leaded gasoline. Factories spewed rivers of chemicals and sludge without fear of much in the way of environmental or legal consequences. Scouting was a welcoming gateway to a changing outdoor world. The need for environmental awareness accelerates again today as the world of scouting continues to move forward. This wilder side tale really starts with Boy Scout Troop 139 based in Ortonville. 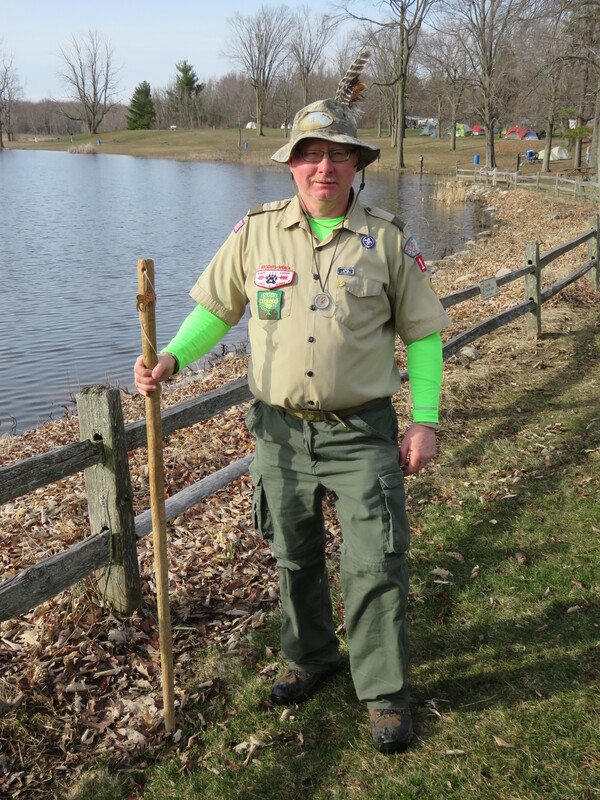 Scoutmaster Jeff Hafnt explained to his troop that he always liked hiking and exploring the 5,430 acres of Ortonville State Recreation Area. He explained this troop is the most northerly located troop of the Pontiac-Manito District of the Great Lakes Field Service Council. Ten years have passed since Hafnt invited more southerly located troops to join them “in the boonies” for a big day hike and the title stuck. The annual hiking event soon turned into a weekend long nature-embracing camping event. 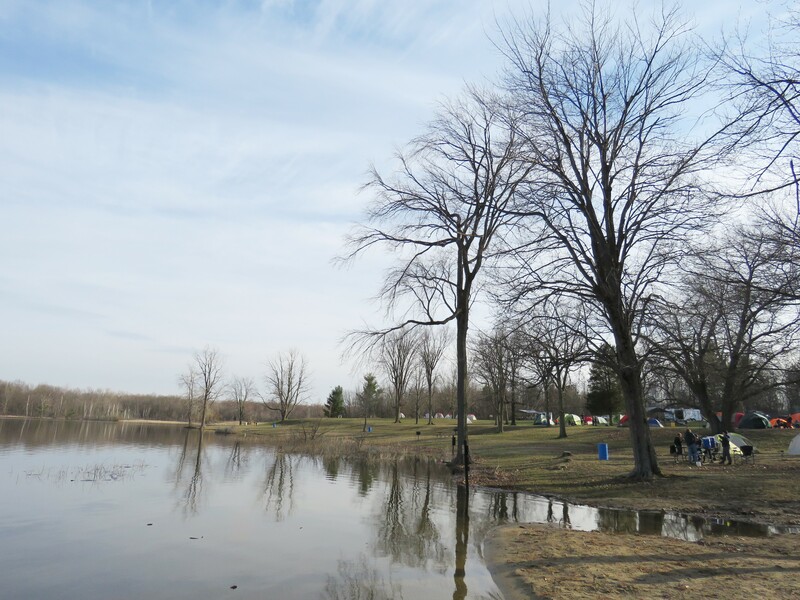 Michigan Department of Natural Resources gave the nod to allow the scouts to tent at Big Fish Lake. I was invited to hike with them for their grand 10th anniversary hike. I arrived at their colorful encampment shortly after Saturday’s sunrise, greeted by bird songs, the drumming of woodpeckers, and the sights and sounds of wood fires and breakfast cooking. As I walked about the shoreline I chatted with members of Troop 326 from White Lake Township. I was surprised to find three young ladies, Theresa, Mariana, and Julia in the mix. I discovered the world of scouting has become more progressive since my days as a Boy Scout. Those three girls are members of Venture Crew 326. Venturing is a coed program of the Boy Scouts of America and designed for scouts between the ages of 14 and 21. The Venturing website emphasizes that crew members are “always looking for adventure.” A thirteen mile hike through the “boonies” of northern Oakland County and southern Lapeer County fit that bill. We began our trek after the lakeside opening flag ceremony. The first hurdle was crossing Hadley Road, the only paved road on the meandering route that started and finished at Big Fish Lake. 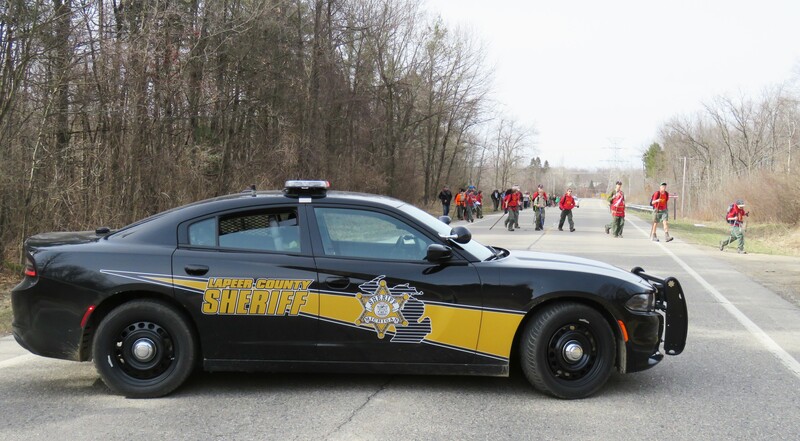 A Lapeer County Sheriff’s deputy graciously blocked the sparse traffic to facilitate that crossing, the last pavement we would see until later in the afternoon. I quickly found myself near the front of the hikers, that eventually stretched out for almost a mile. We meandered under stately white pine trees and massive oak trees and took a few slips in the mud. We crossed our first creek by walking over a fallen tree. The young ladies of Venture Crew 326 had moved to the front of the pack and away from the noise of the army of voices and feet behind us. Fourteen year old Theresa shared her thoughts with me, most notably, “I appreciated this hike because I get outside and away from technology and I love being surrounded by nature and feeling the sun on my face.” And appreciate the hike they did, pausing to move a toad off a trail and to chat about all the “very cool nature things” including the songs of frogs and the last small patches of melting snow. The hill-hugging route crossed over some of the highest elevations in the county, including Pinnacle Point with an elevation of 1,043 feet. The entire route was an open text book of landforms shaped from the last glacial retreat, including moraines, kettle lakes, and ancient lake sands. Some scouts took note of the large glacial erratics: Granite boulders fractured from the Canadian Shield and carried south by a great wall of ice that would have dwarfed the Renaissance Center. The steep hills gave leg and lung workouts and more than a few sighs of exasperation. I was both impressed and surprised by the number of kids that looked at the experience as a wilderness adventure. A testimony to the fact that some sections of Oakland County are still rich in wildness and function as living laboratories of the ways of nature. Our route took us along a few primitive unmaintained roads that bisect the state recreation area. These are roads that no one should attempt in the winter with a vehicle and were challenging while hiking. Lunch break was at the Pines Cabin and then it was back to hills after a ceremonial salute to Earth Day in Oakland County with the planting of a young spruce tree. Five hours passed before we were back where we started, muddy, tired, hungry, and mostly happy. I stayed for dinner to witness Troop 326 in their annual “Cookfest” completion as part of their scouting program. The three young ladies from the related Venture Crew 326 had great fun and struggled to keep serious expressions on their faces as they judged each patrol’s culinary offerings. Troop 185 Leader Konrad Imirowicz later wrote in his summation, “Well, we survived ‘Hike in the Boonies’ 2018. What a great weekend, to date the best Boonies Hike since Troop 185 have been doing them. A true Boonies Hike: trails were very hard to follow at times, we had to use the maps, compass, and instructions often. Lots of mud, washed out paths, hills, streams to cross, overall the best Mother Nature could throw at us.” Words well said, for Oakland County truly does have a wilder side and it’s the boonies of Ortonville State Recreation Area. 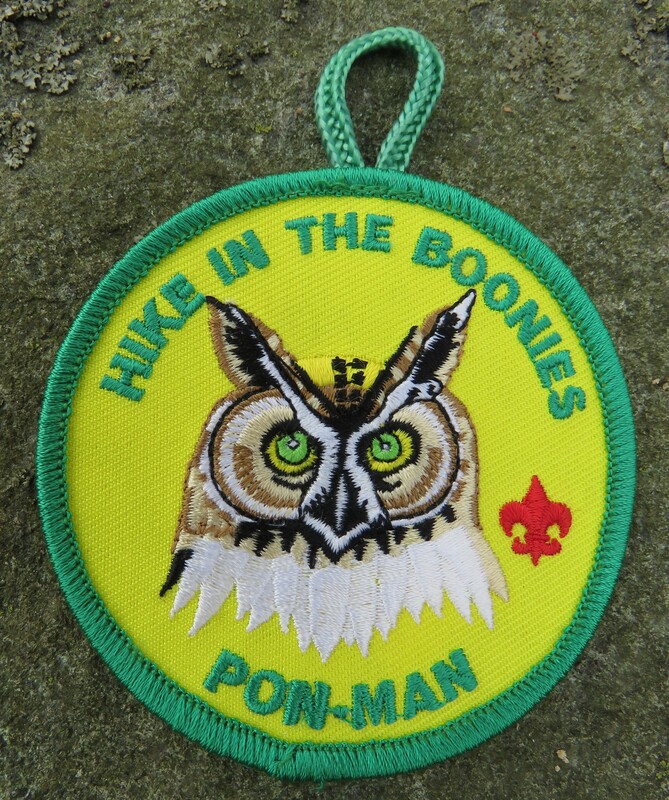 I went home as tired as the rest of them and the proud recipient of my first “Hike in the Boonies” patch.